QuickBooks Desktop Online? You heard correctly – there is a nifty program called Qbox that allows you to remotely access your QuickBooks data without paying the high cost of “hosting”. In fact, Qbox is about 25% the cost of having your QuickBooks file hosted. For many businesses, QuickBooks Online just isn’t robust enough for their business, nor is there a really great 3rd party software application that can replace the functionality they need – the Construction industry is an excellent example. While there are a few 3rd party apps that integrate with QuickBooks Online and handle project management, invoicing and job-costing, their job-costing leaves a lot to be desired – particularly if you have payroll, and the integration is clunky. The Desktop version of QuickBooks does an amazing job, all in one place, but the bummer is – as a desktop program – it’s literally “in one place”. We like flexibility in our lives, and we are used to having the world in the palm of our hand everywhere we go. We want to work from anywhere, and qbox makes that possible at a very reasonable price – currently less than $10/mo. I have many clients ask me if they can just put their data file in Dropbox, and work with it there. The answer is a resounding “NO”. Dropbox is not set up to do this, and hosting your data file there will result in lost or damaged data. 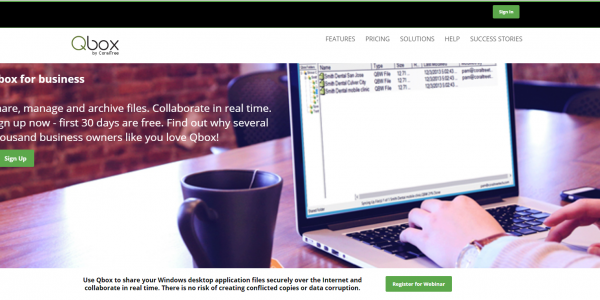 Qbox works very much the same as Dropbox, but it has been designed specifically to host QuickBooks files. Qbox is particularly awesome for accountants and bookkeepers who work with clients Desktop files, or sharing data files with others in your firm. In fact, for internal use, you can put all of your data files in one folder, and pay only one monthly fee. In other words, the fees aren’t by the data file, but by the “shared” folder. If you are like me, you have tons of questions, and I haven’t touched on many of the great features Qbox currently has and they are working on even more. Yes, you can use Qbox with almost any other software add on (Bill.com, TSheets), and yes you can use it multi-user mode (with some limitations). Yes, you can share other types of files, and so much more.